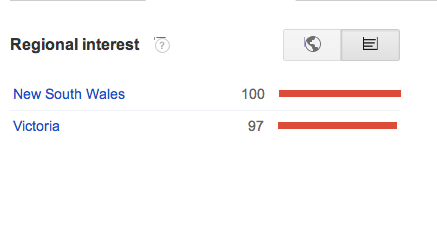 This is just a short breakdown of search terms used to find funeral homes in NSW through google. I looked at a few terms people use to find funeral homes. As part of exploring how people think of the funeral industry. Originally this was just background research and possible evidence. But I thought it interesting enough to get its own post. How funeral companies (specifically funeral homes) are found on the internet in Australia. 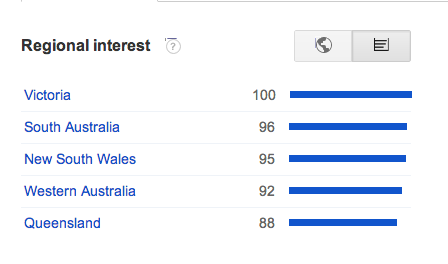 To explore this I first looked at search terms, what terms people search in Australia related to funeral homes. The top two terms, as shown below, were "funeral home" or a combination of "funeral" and a city. If people had a tendency to add their location to the search then it would mean their search would get very specific results. While this is something to note it does not impact on my results or purpose. Funeral searches over the last 12 months. As seen above, these two terms are used significantly more than "funeral director". However, when looking at the regions within Australia where these terms are used we discover something important. That "funeral home" is used relatively equally around Australia, yet "funeral director" is only used by NSW and VIC. This second term is not used enough to be noted outside these two states. Furthermore "funeral home" was searched for 95 times and "funeral director" was searched for 100 times in NSW. Thus the second term, while less common over all in Australia, is just as common in NSW. These are the three main terms people would use to find a funeral home though google. Google then encourages people to use google maps if using these terms. This is not to say people use this method to find a funeral home when planning a funeral. Word of mouth and advertisements would have a noticeable effect on that. Yet I do not seek to explore that, I am simply looking at how the funeral industry is interacted with by the public. This is the wording people use to find and describe the funeral industry in NSW. Thus this could be used to tell us not how people find funeral homes, but how people think of funeral homes.